My children are 7 and very nearly 5 now, so it’s safe to say we are well and truly out of the toddler stage. I do remember that stage well though. And one of the things I remember is how hard and frustrating it can be at times to communicate with your toddler. It can feel like they’re not listening to a word you’re saying, and it can be really difficult to work out what they’re trying to tell you at times. 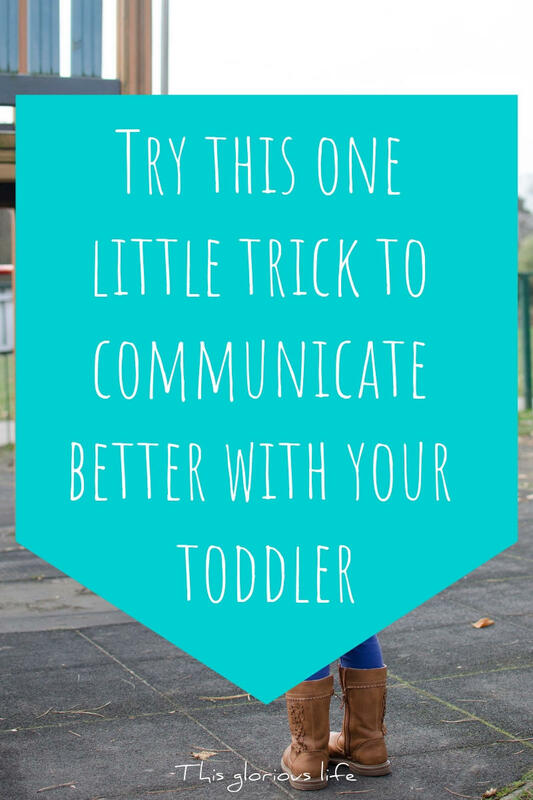 This little trick though is brilliant for improving communication during the toddler years. 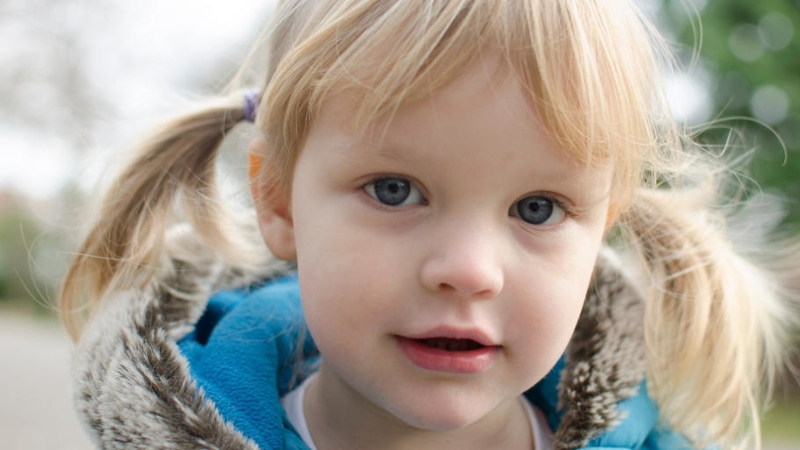 The best place to start with building better communication with your toddler is with mirroring. This is basically just a way of letting them know that you’re listening to them, and that you understand how they’re feeling. This then makes it far more likely that they’ll listen to you. So let’s say it’s a cold day and you’re trying to get your toddler to put their coat on so you can walk to the shops. And they’re having none of it. They’re getting upset and angry and refusing to even entertain the idea of putting their coat on. 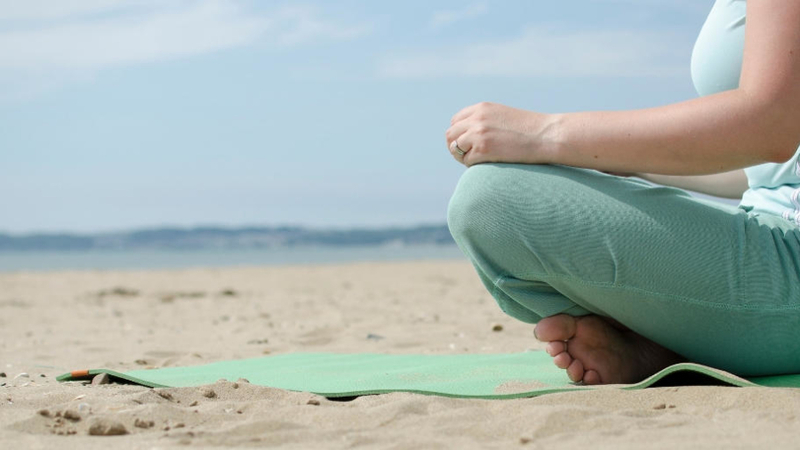 What you need to do is, firstly, take a few deep breaths. Then get down on your child’s level and talk to them about why they don’t want to put the coat on. Listen to what they have to say, and then basically repeat what they’ve said back to them. If they tell you they’re too hot in their coat, you would reply with “I know, it feels hot when you put your coat on doesn’t it. And that makes you feel a bit hot and bothered and uncomfortable”. This both shows you’re listening to your child, and that you understand how they feel about the situation. Once you’ve done this, they’ll hopefully calm down a bit knowing that you’re with them, rather than against them. Then you can explain why they need to put the coat on. Tell that while it’s hot in the house it’s really cold outside and so they’ll need their coat. Now, this won’t necessarily work every single time. But if you always make the time to really listen, and empathise with your toddler then there is a better chance they’ll listen to you in return. There’s also the other benefit that listening to them and seeing things from their point of view might make you stop for a minute and question how important your request really is. Does it actually matter if they put their coat on before you leave the house?! Maybe you can just take it with you and they can put it on after a few minutes outside when they realise how chilly it actually is. It can feel like a real battle at times when you have a toddler. But just keep in mind that it really is you and them together, with each, not against each other. If you can work on seeing the world through their eyes and understanding their feelings and frustrations through this kind of active listening then you should be able to find a positive way to resolve most of these battles. I feel very comfortable in my daily and weekly routines, knowing where I’m going and what I’m doing. The thing is, I’m not sure if this is really a good thing. The problem with getting too comfortable in our routines and habits is that it becomes quite scary to think about stepping outside of them. 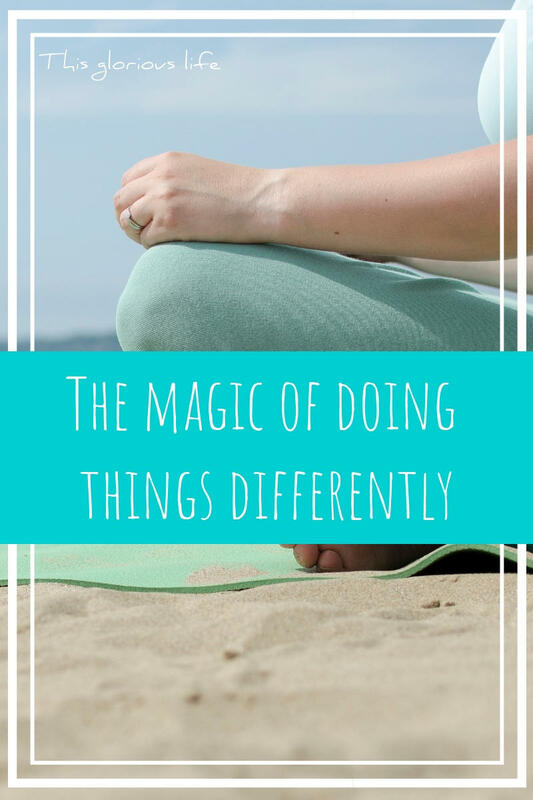 This is something I think I need to tackle though because there is some magic in getting out there and doing things differently. The thing is, our brains are quite lazy. By which I mean that our neural pathways work on the path of least resistance. We use shortcuts and habits to go about our daily lives without using too much brain power. The things we do everyday end up being done on autopilot. How many times have you driven home from work and realised when you got home that you can’t actually remember the whole drive? Think about all the things you do everyday without consciously thinking about it. Our brains have formed pathways for these activities that are so well used that we can do them without any real effort at all. This is why they’re safe and comfortable and familiar. A lot of the time this is good, these autopilot thoughts and activities let us conserve our mental energy for things that need it more. The problem is when we get so stuck in these familiar thought patterns and routines that we don’t experience anything new. When we’re young we’re constantly learning new things and having new experiences that form new pathways in our brains. As we get older though we stop learning as much. We repeat activities and thoughts and beliefs so much that they just become part of who we are. So what we need to do is keep experiencing new things. 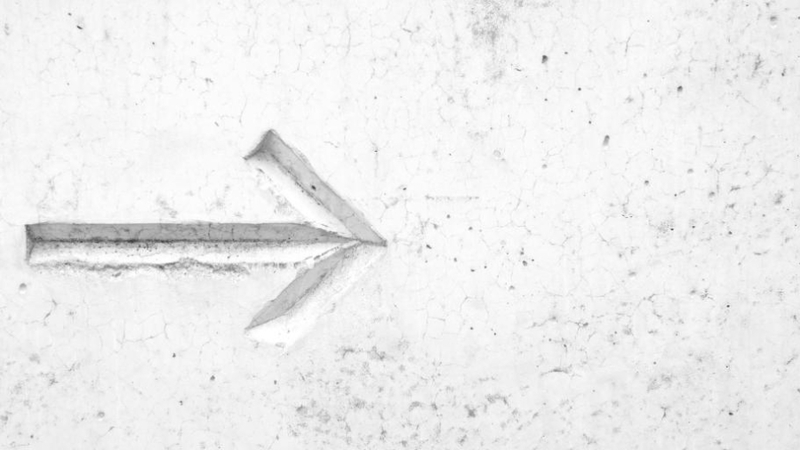 Stop relying on our familiar routines and push ourselves to mix things up a bit. That’s where the world comes alive for us again, as we see things in a new way and experience that child-like wonder again. You don’t have to do anything dramatic like emigrate to Australia or take up sky-diving. Although you can if you want to. Book a football tournaments holiday instead of your usual beach holiday. Get your colours read and KonMari your wardrobe so you’re just left with things you love that suit you perfectly. I think the best way to start though is to just make little changes on a regular basis. Walk a different route to work. Take pasta salads and soup for lunch instead of the same old sandwiches. Rearrange the furniture in your living room (remember how amazing it used to feel when you rearranged your bedroom as a teenager?). Workout in the morning instead of in the evening. Take a yoga class instead of a spin class. Try anything and everything you can think of to mix things up a bit. Challenge your thought patterns and beliefs. Push out of your comfort zone. It can be really scary to start with. Especially if you have any kind of anxiety, it can be hard to leave the safety of our reassuring routines. To feel excited about new things. To find joy and happiness in new experiences. To challenge our beliefs about the world and ourselves that we’ve held on to for so long. I used to exercise quite a lot before I had the children. I would go to the gym several times a week; for classes and to use the equipment. I would go for jogs along the seafront. And I would do exercise DVDs at home. Then I had Rhys and it all stopped. I just lost my motivation to do any formal exercise, and was happy with pushing the buggy everywhere as a way of keeping fit. In the last few years though I’ve got back into the habit of doing exercise DVDs at home. I think they’re the best option for me at the moment, it’s so much easier than trying to get myself out to the gym. The thing is though, it can be really hard to get into the habit of exercising when you’ve taken a break from it. Or when you’ve never really done it before. 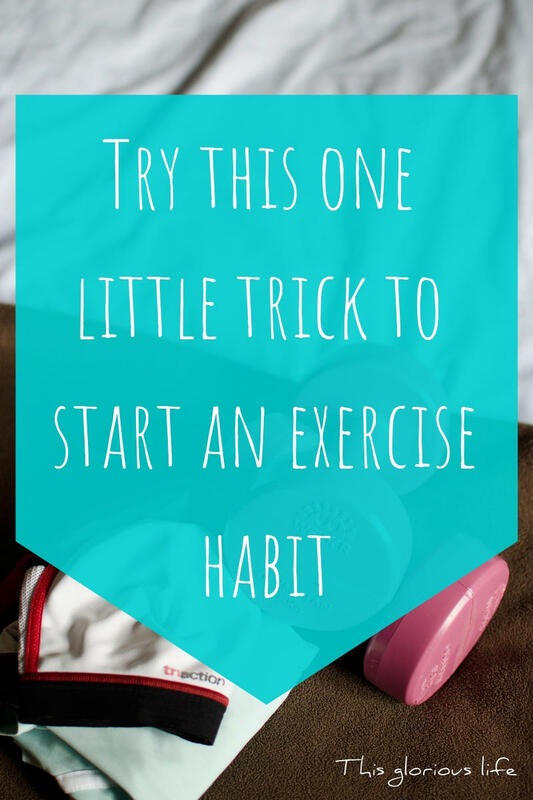 So here’s a little trick I’ve used that you can try to make it more likely that you’ll get started with a new exercise habit. Do whatever you can to make it almost impossible to not do it. Make it so easy to do whatever kind of exercise you’re going to do that you simply can’t not do it. How’s that for a fun double negative! If you want to start fitting exercise into your life, but find that you can quite easily talk yourself out of actually doing it then you need to make the whole thing as easy as possible for yourself. So if you’re planning on doing an exercise DVD at home once you’ve dropped the children off at school then put your exercise clothes out ready to change into as soon as you walk back through the door. Better yet, wear them on the school run so you don’t even need to change once you’re home. Put the DVD in and ready to go so all you have to do is hit play. Or if you’re doing a workout from YouTube then get it all lined up ready to go as soon as you get in. The trick here is to not give yourself time to overthink it and talk yourself out of exercising. Make everything so simple that before you know it you’ve already started. 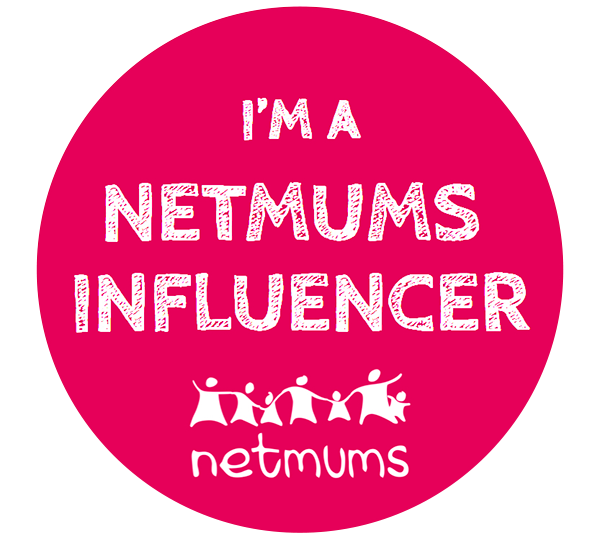 This isn’t just something that works for stay at home parents of school age children. It can be applied to pretty much any situation. If you plan to get up a bit earlier and exercise before heading to work, then the same thing applies. 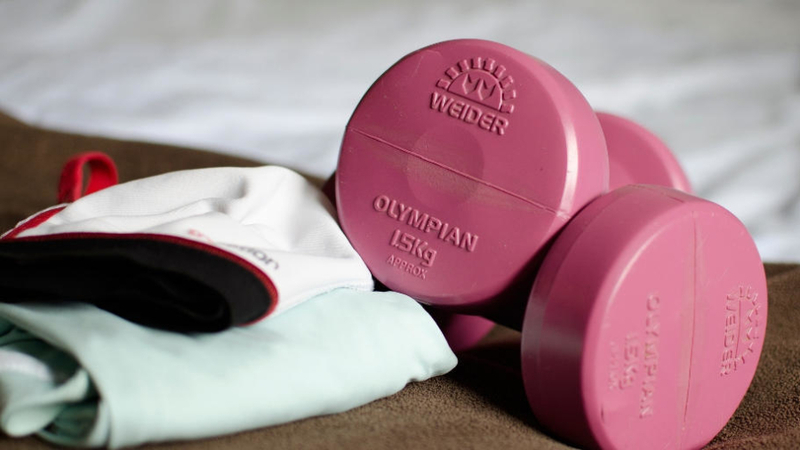 Put your workout gear out so you can pull it on as soon as you get out of bed. Have the video lined up ready to simply press play. On the other hand, if the best solution for you is to hit the gym after work then the principle is still the same. Pack your gym kit the night before and have it ready to go by the front door. Pick a gym that is either close to work or close to home if you can, so you don’t have to go too far out of your way to get there. Make exercising a no-brainer, the easiest thing you’ll do that day. If you still find that you’re coming up with excuses not to start, then take a look at them one by one and do whatever you can to bust them. If you feel you don’t have time to fit an hour-long exercise session in to your day, then look at the alternatives. There are some great 20 minute workouts that deliver the same results. Or you can change up your routine a bit to squeeze in tiny bits of exercise, if your schedule really is jam-packed. The main thing is to make it so easy to start exercising that you don’t have a chance to decide not to do it. I also know that coming home from the school run and seeing my exercise clothes out ready makes me feel like I’d rather just get on and do it, rather than feeling bad about packing it all away again having not worked out. Have you been wanting to start a new habit of exercising regularly? Hopefully this trick will help you get going with it, and if you have any other bits of advice or ways to make it easy as possible please do leave me a comment and let me know! Most days after school, if it’s dry enough, we stay and let the children play for a bit before heading home. They play in the school yard which has a brilliant wooden fort and little obstacle course which is fantastic for them to burn off some steam after a day at school. The outdoor space and facilities are great at our school, and there is quite an emphasis on outdoor play and learning there that I really love. The children are encouraged to get out and get stuck in and often come home muddy and dishevelled. 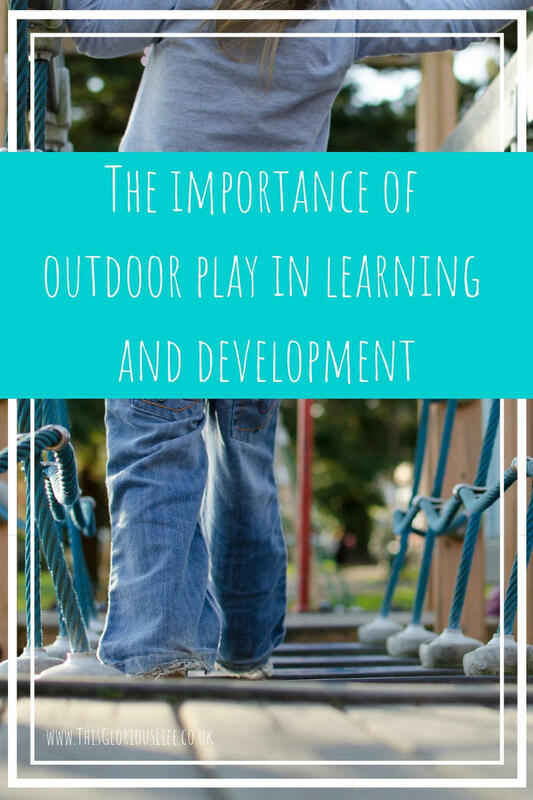 The school is really on to something with this I think, because there are all sorts of benefits to outdoor play in terms of our children’s learning and development. Swiss psychologist Jean Piaget once said “Play is the work of childhood” and that is a sentiment that I really love. The thing is, children aren’t built to sit still and focus on learning. Apparently up until they’re at least 9 years old children learn best when their whole self is involved in the process. So sitting at a table and listening to a teacher talk isn’t going to help them learn as much as actively getting involved in something. Young children in particular learn best through play. When they’re playing they’re learning how to solve problems and they’re being creative and experimenting in all sorts of ways. Play does so much to support our children’s cognitive development. It’s through play that they learn skills like understanding and communication, as well as things like risk assessment and cause and effect. What seems to be really important though is that the play needs to be unstructured. Children don’t learn in the same way if adults are directing their play. They need to be left to explore and play the way they want to play to really get the benefits. This is one of the things I love about the play equipment at our school – it’s not obvious what each piece should be used for. There are quite a few wooden structures that can be a fort, a stage, a family home, or whatever else the children can come up. There are also shapes and tracks and games painted on the ground too which are brilliant for creative play and learning. ESP play produce all sorts of play equipment and playground markings like the ones our school has, and have spent a lot of time researching the benefits of them. 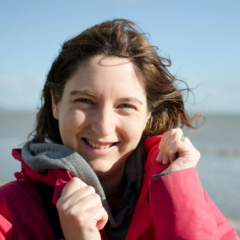 If you pop over to ESP play’s website you can see their findings into the effects that outdoor creative play can have. They have playground equipment for all ages from pieces suitable for early years play all the way up to secondary school. 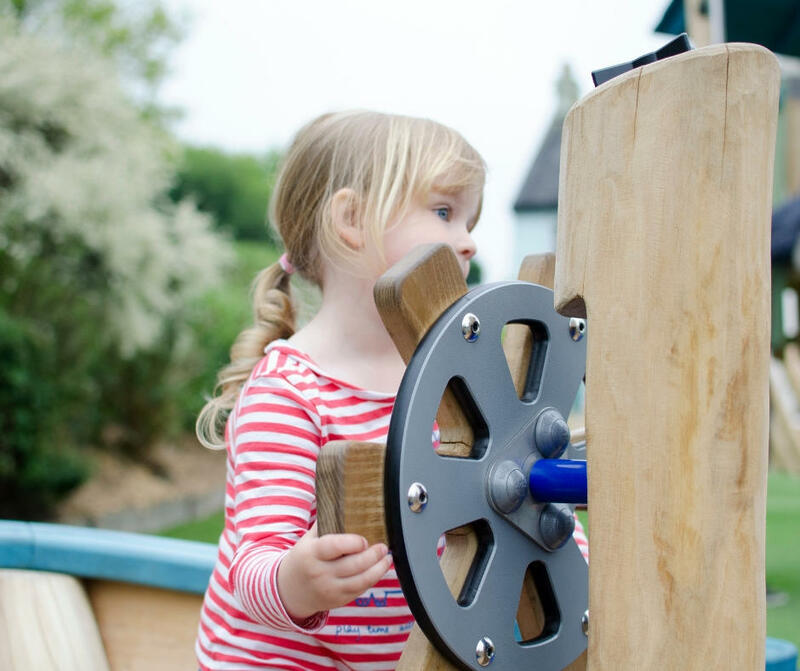 They recognise findings from various studies that show that children need this kind of play environment where they aren’t restricted in the way they play. So the children are free to come up with their own ideas and use the equipment creatively. When children have this freedom to make up their own games, either by themselves or with other children, they learn so much. They learn to figure things out on their own, to communicate better and to negotiate. These types of skills are known as executive function skills and they’re so important for our children’s development. When children play in this way new pathways and circuits are built in the prefrontal cortex that help them navigate these different social situations. So playing actually creates changes in our children’s brains, wiring up its executive control centre, to set them up to be able to handle these complex situations in the future. 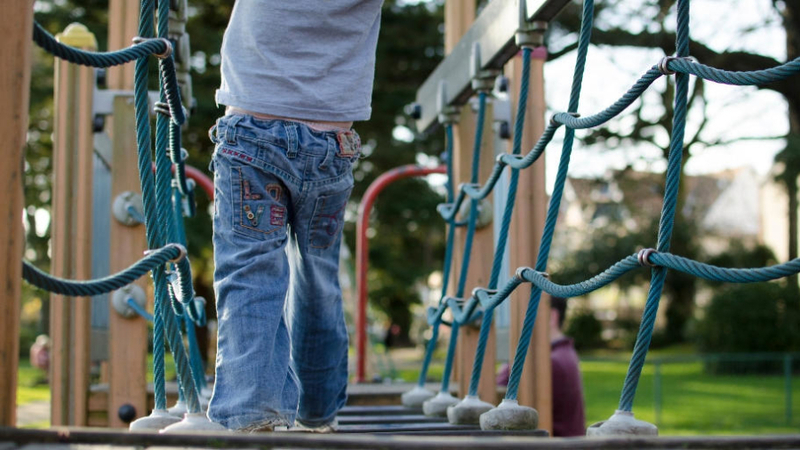 One big developmental benefit to outdoor play that us parents can sometimes find a bit hard to cope with, is the way it teaches our children about risk and about their own personal limits. Our instinct as parents is to keep our children safe and to protect them from any possible harm. But if we constantly hover around them while they play, shouting pleas for them to be careful, they’ll grow up scared to ever take risks or push themselves to see what they’re capable of. When we take a step back and let our children climb that tree or try a new way of getting down the slide they learn so much. They develop risk assessment skills and learn about things like physics and gravity! And from trying things and failing they learn to get back up again. To try again. To be brave. 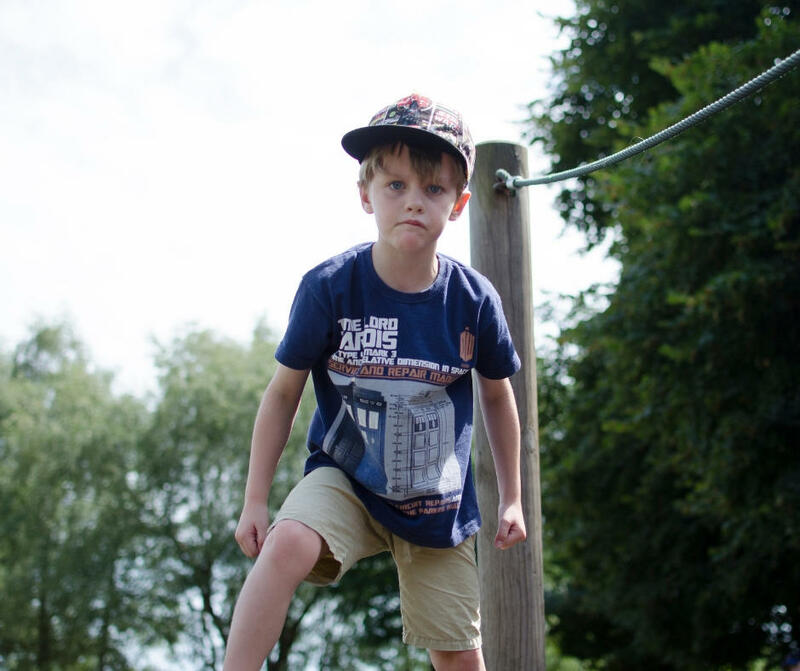 This photo of Rhys was taken at the park one day when he faced his fears and climbed up to the top of this wooden climbing frame. He had been so scared to do it, and I realised that me standing right by him wasn’t actually helping. So I backed off a bit. Gave him the space he needed to take a deep breath and go for it. Those are the clenched fists and determined face of a boy who achieved something he wasn’t sure he could. And that is the beauty of outdoor play. It gives our children the chance to try things. To have fun. To explore. To take risks. To push themselves. To develop in so many ways. Disclaimer: this is a sponsored post with esp play. Unless you have a job that involves working outside, chances are you spend a fair bit of your time indoors. It might be that you spend a lot of your time at home with your baby, or children if you home-school. Or it might be that your days are mostly spent sitting in front of a computer at the office. 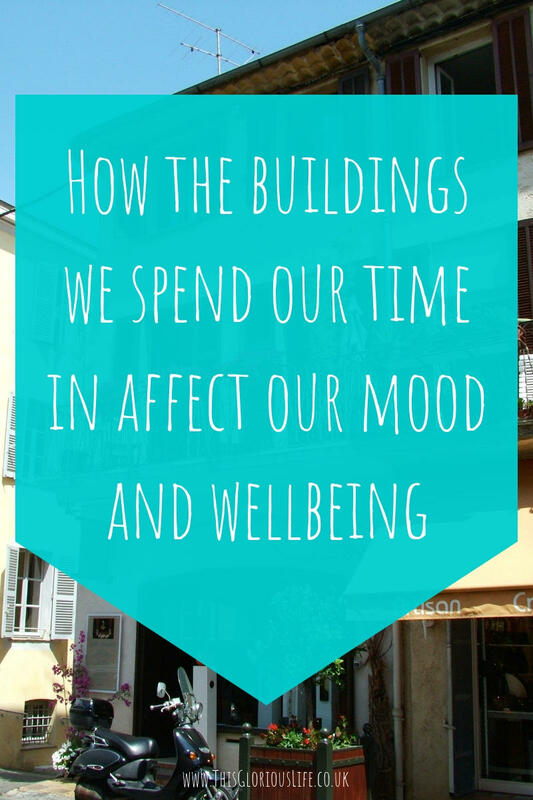 Wherever you spend the bulk of your time, have you ever really thought about how the different buildings we spend our time in affect our mood and sense of wellbeing? The simple answer is that our mood really is impacted quite a bit by the buildings that we spend our time in. All sorts of studies have been carried out that show that buildings and the way they’re decorated can influence both the way we think and the way we behave. One of the major factors in how buildings make us feel is the amount of natural light that they let in. Buildings that don’t have that many windows and so don’t let in much natural light have been found to make us feel less motivated and generally feel low. On the other hand, buildings with plenty of big windows that let in large amounts of natural light make us feel happier and more relaxed. Rooms full of natural light can feel more spacious too, which has been found to be a good thing for our wellbeing. A study carried out at the University of Minnesota in 2007 found that rooms with higher ceilings can allow us to think more freely and be more creative. So if you feel uninspired and stuck in your head then visiting somewhere like a cathedral with lovely high ceilings might help inspiration strike. The colours we use in our homes and work environments can have a huge impact on our mood too. If you want to create a calm, peaceful space then blues and greens are a great way to go. If, on the other hand, you’re looking to feel energised and fired up then reds and oranges are much better. The thing to keep in mind is that it’s not just the colour on the wall that can affect our mood, the flooring that we have in the building can have a big impact too. Research has found that buildings that use wood and wooden products in their interior design can help to lower heart rates and blood pressure, as well as help us feel less anxious and stressed. So installing something like Parador engineered floors in your home can help make it a more relaxing place to spend time in at the end of a busy day. The beauty of engineered floors is that they’re hard-wearing and designed to be a practical and versatile alternative to hardwood floors. They also come in a variety of colours that, again, can really change the feel of a room. Warm shades of brown are a classic option and make us feel relaxed and comfortable. They’re great if you like to embrace everything hygge and enjoy cosy evenings curled up with a good book. If you want to feel a bit more energised though then white or lighter coloured wood flooring can create this atmosphere of calm yet energised, like being by the beach. The things we fill our space with can also have a big influence on our mood and sense of wellbeing. A study by Zeisel et al. found that patients with alzheimers showed reduced levels of anxiety, depression and social withdrawal when they were in private rooms with their own personal objects around them. So displaying our favourite photos and personal objects can make us feel better than living or working in a blank, impersonal space. 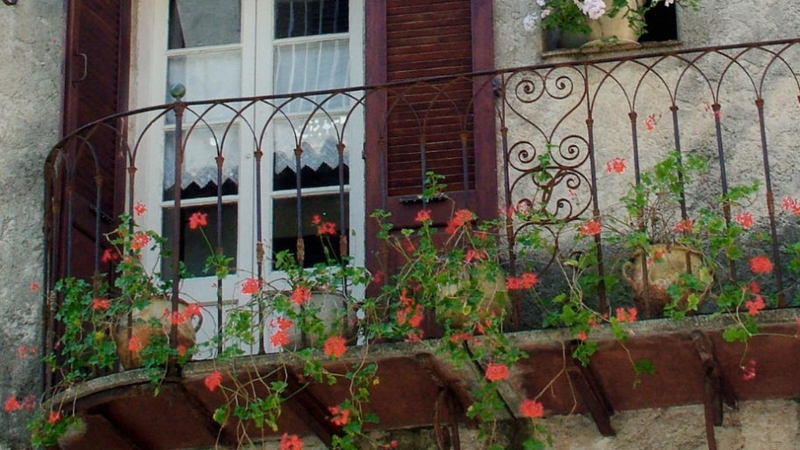 Buildings with plenty of plants and greenery also have a positive affect on us. Professor Frances Kuo found that apartment buildings in inner-city Chicago that were surrounded by vegetation experienced about half as many crimes as those that had hardly any greenery. Various studies have also found that having plants in the workplace helps us feel less stressed and increases productivity. So if you’re looking to move home or redecorate then take some time to really look at different buildings and spaces and think about how the light, colour and furnishings will affect how you feel when you spend time there. If you’re not able to change your home you can still benefit from the positive impact of buildings on our wellbeing by taking time regularly to visit different places. Spend time in green spaces as much as possible. Take a walk through your town and find interesting architecture that interests you and maybe even brings you a sense of awe. Find a local cafe with warm wooden flooring and a cosy interior design to relax and switch off for a bit after a busy day at work. Why don’t we read manuals and follow instructions? Our brand new kettle, or flat pack cabinet or even dolls house for our child arrives, and with it a big instruction manual. Some people will crack open that manual and read it all from cover to cover before doing anything else. Those people are absolutely in the minority though, and possibly have too much time on their hands. Most of us will have a flick through the manual to get a rough idea of what we need to do and then just dive in. Possibly dipping back in now and then when things get a bit tricky. But why is this? 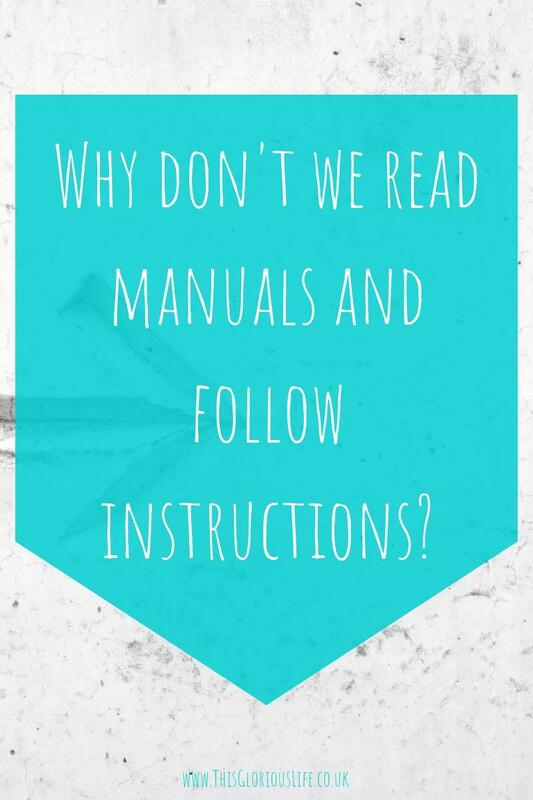 Why don’t we like to read manuals and follow instructions? One of the main reasons we don’t read manuals is that we don’t have time. Or more likely we don’t want to spend the time it would take to sit down and read a manual properly. We would rather just get stuck in and see how we get on. Sometimes this approach works, but so often it doesn’t and we end up wasting more time than if we’d just read the manual in the first place. A lot of the time we think the manual is going take longer to read than it actually would, because the same instructions are repeated in multiple languages. If we would just take a minute to open up these multilingual manuals we would realise that the instructions are shorter than we first thought. Another reason we don’t read manuals is because we think we already know enough to manage by ourselves. If we’ve had a stereo or microwave before we think we’ll be able to work out how to use a new one without reading the instructions. A lot of the time with this we’re right, although it does still often end up taking us longer to figure out than if we’d just read the manual. Our past experiences also make us wary of reading instruction manuals. So often in the past we’ve tried to make sense of them but they’ve been written so badly that we just give up. And then the next time we have a new product we decide not to even bother trying with the instructions. Especially because these days we know we can quite easily find videos online to help us if we get stuck, or we can just call the company’s helpline and let them talk us through it. What we really need are manuals that are concise and clear, not overly complicated and long-winded. More and more companies are starting to realise this, and are making quick-read versions of their instructions alongside the full manuals. This means that we can use those to get started with our new items as quickly as possible, while still having all the detailed information and technical documentation on hand should we need it later. The thing is we’re all so busy these days, we don’t want to spend valuable time reading an instruction manual. But this is one time when it’s worth slowing down a bit and taking the time to at least try to follow instructions properly. As long as they’re well written, clear and concise then reading them can save us a lot of time and stress down the line. Do you read manuals and follow the instructions, or do you prefer to just dive in and try to figure it out on your own? I think it’s safe to say that the UK is a nation of D.I.Yers. Every bank holiday you’ll find people all over the country getting stuck in to redecorating their living rooms, refitting their kitchens or building flat pack furniture for the bedroom. But why is this? What is it about doing it ourselves that we seem to enjoy so much. 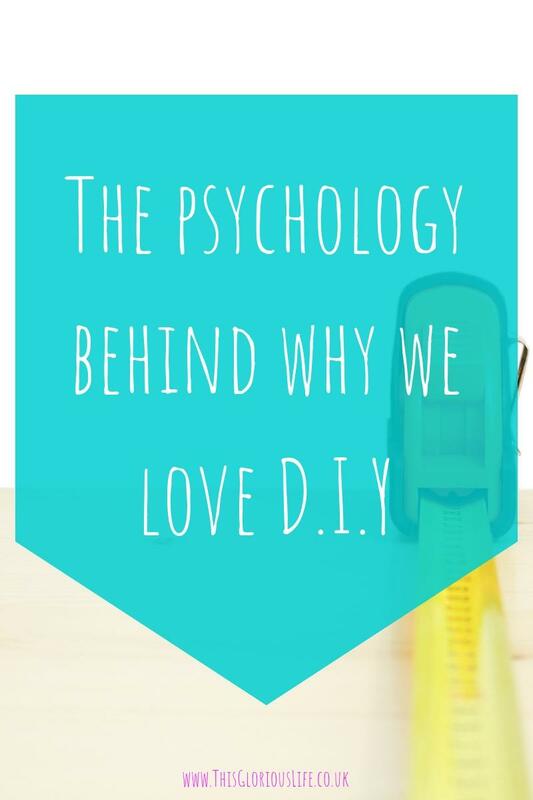 Turns out there is some interesting psychology behind why we love to D.I.Y instead of paying someone to do these home improvements for us. When we look at our homes and see big jobs that need doing, like repainting, changing the kitchen units or putting up new fencing in the garden, why do we decide to do it ourselves? With these kinds of things, and especially with really big jobs like extensions and loft conversions, it would make more sense to hire professionals to do the work. It would, in theory at least, be done much more quickly and efficiently. And you would know that the work was done safely and to a good standard. With sites like price your job it’s really easy to find tradespeople too. So why do we choose the D.I.Y option so often? A lot of the time it comes down to the fact that it can be a lot cheaper to do it ourselves. Other times though, it goes a bit deeper than that. A paper written by Moisio, Arnould and Gentry found that our lifestyle and what we do for a living can impact our desire to do D.I.Y jobs at home. For people who work in high-powered jobs where they tend to sit at a desk all day, doing home improvements at the weekends is a way of feeling more connected with their inner craftsman who likes to get their hands dirty. On the other hand, someone who does a more hands-on job earning less money might use D.I.Y as a way of reinforcing their identity as someone who cares for and provides for their family. Giving them the home they want without having to spend a fortune to get it. What’s also interesting to know is that we put more value on things we’ve built ourselves. Even if it’s just a piece of flat pack furniture that we assemble at home. We tend to have more attachment to these items and feel they’re worth more than pre-built pieces. The same goes for decorating around the house. We take more pride and see more value in rooms that we’ve taken the time and effort to paint or wallpaper. The thing is, according to a survey or around 2000 people, almost half of the D.I.Y jobs we start don’t get finished. And 25% of the time that’s because we don’t have the expertise needed to complete the job. 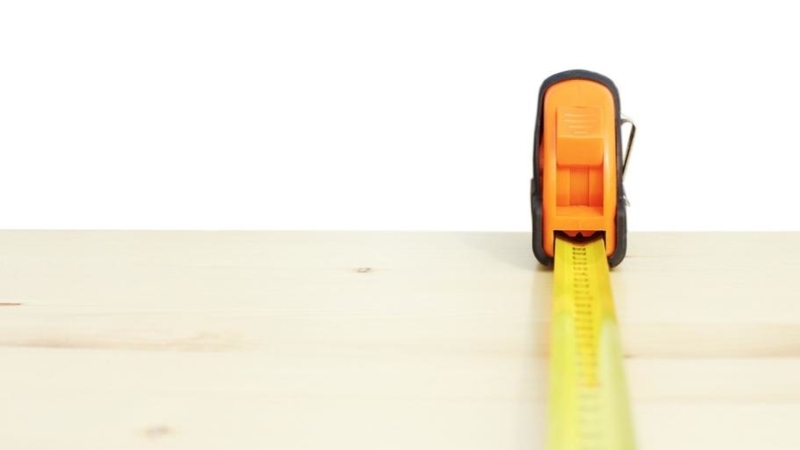 So before you get caught up in the excitement of home improvements, take a few minutes to decide if it’s really something you can do yourself or if you’d be better off calling in the experts. Do you like doing D.I.Y jobs at home? Do you have any tips for making a success of it?